Again, rather than speculate, we can see the Text itself: Acts 9:1-2.. Paul for the zeal of the Jewish law, “I persecuted the church of God” (1 Cor. 15 :9) … “as to zeal, persecutor of the church; as to the righteouness which is in the Law, found blameless.” (Phil. 3:6) Here he is yet simply in blind unbelief, even as a “righteouness” Jew. So here simply yet profoundly Paul was in “unbelief”, “blind” to the “Christian” God, and His Christ! At this point. This is really the essence of what Paul does say, until he sees Christ! (Acts 9:3-5) And the hands of Ananias lay upon him..(Acts 9:10-19). Could it be possible that Saul and the other Jews present were almost insulted with Stephens preaching (beyond the fact that they believed it false teaching), in the way that he (a Hellenistic Jew), was placing the responsibility for the death of Christ on the Jewish leaders (who would have been devout Jews, wholly obedient to the Jewish laws if I understand correctly)? Coming from a more human stand point than a historical one, I would think that hearing a Hellenistic Jew, placing blame on the Jewish leaders for the most controversial death to ever happened could indeed stir up their anger for more than righteous reasons. So that would be a answer/question response to what you asked, “What was it about Stephen’s speech that pushed Saul to such a violent response?”. Could that blame/anger aspect be part of the crowds reaction? As we know there always has been and there always will be persecution against the church until the end. It doesn’t seem all that odd that a large group of similarly minded people would reject and become violent against apparently one lone man who is trying to say that they are totally wrong. Who would ever know, we can cover this up easily could possibly be what some of them were thinking? Is there an easier way to get rid of a threat? This situation sounds like an instance of group persuasion because the Jews used persuasion just a little bit earlier to cause Stephen to face the Sanhedrin in the first place. In Acts 6:11 we find that the opposition “secretly persuaded some men to say ‘we have heard Stephan speak words of Blasphemy against Moses and against God.’” According to Polhill we find that Stephen “turned the accusations back on his accusers” (p.36). He didn’t just say that they killed the Messiah, he also said that they “turned the worship of God into idolatry” (p.36). One thing that I could not help from wondering about is: could there have been other Christians there? I think I agree with Micah when she says, “Saul and the other Jews present were almost insulted with Stephens preaching [because he] was placing the responsibility for the death of Christ on the Jewish leaders.” In my experience, when people are lying and trying to deny something, they usually do not have actual evidence or a substantial reason to prove what they are fighting for. They just get more and more upset till the person they are yelling at gives into them. I think the Jews at Jesus’ trial in Luke 23 are a good example of this, “Wanting to release Jesus, Pilate appealed to them again. But they kept shouting, ‘Crucify him! Crucify him!’ For the third time he spoke to them: ‘Why? What crime has this man committed? I have found in him no grounds for the death penalty. Therefore I will have him punished and then release him.’ But with loud shouts they insistently demanded that he be crucified, and their shouts prevailed” (Luke 23:20-23). Pilate tries to find a reason why Jesus would be guilty, but the Jews just yelled “Crucify Him!” and “Demanded that He be crucified.” Clearly they did this because they had no real reason to crucify Jesus. I think they wanted to kill Jesus because He was not the King or Messiah that the Pharisees wanted or expected. They wanted somebody majestic that would rule over them. They could not look bad by being wrong. This all goes to say that I think the same thing is happening in Acts 7. “When the members of the Sanhedrin heard this, they were furious and gnashed their teeth at him. ‘Look,’ he said, ‘I see heaven open and the Son of Man standing at the right hand of God.’ At this they covered their ears and, yelling at the top of their voices, they all rushed at him, dragged him out of the city and began to stone him” (Acts 7:54:57). Once again, logic is thrown out, and chaos reigns. They refuse to even hear Stephen because cannot accept that what Stephen’s saying is right. The reason I have rambled for so long on all of this is to say that Saul comes from this same background. He is, as we talked about last week, a classic, by the book Jew. “If someone else thinks they have reasons to put confidence in the flesh, I have more: circumcised on the eighth day, of the people of Israel, of the tribe of Benjamin, a Hebrew of Hebrews; in regard to the law, a Pharisee; as for zeal, persecuting the church; as for righteousness based on the law, faultless” (Philippians 3:4-6). Of course he would be right there holding the cloaks of those who participated in Stephen’s stoning (Acts 7:58). I would almost go so far as to say that getting rid of people who thought Jesus was Messiah was what these people lived for. They lost sight of waiting for the Messiah to come (they had already missed that), and now they were so set in their ridiculous ways that they went even farther by killing any Christ followers they could. This is how deep Saul was set into this lifestyle. This certainly goes to show how God could choose someone so deep into heresy and so set in his ways and bring him back to Him. God’s grace is a very powerful thing. As others have mentioned Saul was a Jew through and through (Philippians 3:4-6) and as such he had qualms about those who opposed the Law or the temple in word or deed. It was a natural response then for Saul to react harshly against Stephen a man “attacking” the core of who Saul was. People often react harshly even out of character especially when you call their beliefs, ideas, or convictions into question. This circumstance with Stephen was no different… the crowd would not even let him finish speaking before dragging from to his death (Acts 7:57-58). The message of Stephen and even Jesus Himself was not the message they were waiting for. They were looking for a much different “messiah” (political influence) who would save and bless them. The Messiah Stephen preached did not make sense… He was supposed to restore all things not disregard the Law and die on a tree. Saul and the crowd could not see the truth of Stephens message until the scales fell off their eyes (Matthew 13:15; Acts 9:18). So often it takes a dramatic experience to change the way we see and interact with the world thankfully Saul experienced this process in becoming Paul. I feel Saul was using and abusing the privilege he had to work in the Synagogue, used it against Steven when he was preaching by rallying up the crowd to stone him. 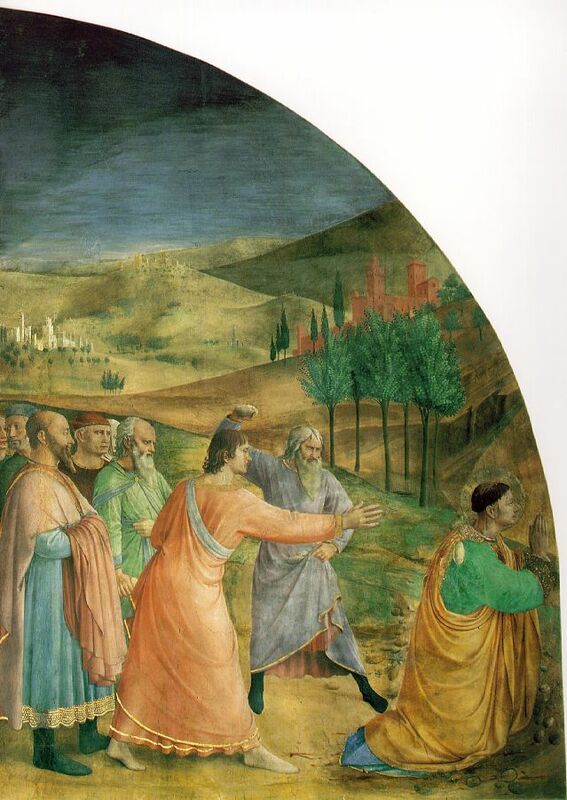 As an official he had the choice to ether calm the crowd or to anger them to the point of rage and then resulting in the stoning of Steven, he chose the latter one. As JT said, there will always be a persecution against the Church, as followers of Christ, and by calling our Lord Jesus our God, we enrage a large amount of Jews and other religions because we believe in blasphemy. No matter where we go in life, as Christians we will be shut down, persecuted, killed, mocked and abused. The only way to get passed that is to have an attitude like Steven, where he asks God in Acts 7:60 “then he fell on his knees and cried out, “Lord, do not hold this sin against them.”” Such an incredible attitude for someone who is being stoned to death, faith like non other, I personally await the day where I can stand before Steven and ask him what that was like, and where his heart was when that crime was being committed against him. The glory of God shows through Saul’s actions against Steven, and later on in Saul’s life, I am sure he was enraged with himself, and was faced with having to ask for forgiveness of himself to continue to preach and teach for God. These are very serious accusations and claims, especially in the heat of so much political and religious uneasiness and unrest. Statements like Stephen’s carry a great deal of emotional weight behind themfor any man of faith. “…to be upset at the notion of Israel rejecting God.” Yes, this is the right track. The accusation which Stephen makes is an attack at the current administration, they killed the messiah and now reject the promised Holy Spirit of the New Age! Stephen accuses the High Priest of acting against God, causing the violent reaction. Saul (Paul) persecuted the Jewish Christians because he saw them as following a blasphemous way, declaring that Jesus was the Christ. As has been said, Jesus died on a tree, thus becoming a curse, and how could a cursed person be the Savior? The followers of this sect, thought Saul, must be killed. They were essentially giving loyalty to a false god by honoring Jesus Christ as the Messiah, and God is obviously highly against idolatry: “I am the Lord your God, who brought you out of the land of Egypt, out of the house of slavery; you shall have no other gods before me” (Exodus 20:2-3). Paul was vehemently passionate about this, as Polhill (pg. 37) mentions: “Acts describes Paul as being intent on destroying Christians, entering the homes where their house churches spewed threat and murder against the Christians (9:1). He ‘raised havoc’.” Paul was like a lot of religious followers can be today: “they have a zeal for God, but not according to knowledge” (Romans 10:2). He had sincerity, but it was going in the wrong direction until the Damascus Road when Jesus revealed himself to Paul. “a blasphemous way, declaring that Jesus was the Christ.” Why is this blasphemous? Gamaliel did not think it was blasphemous (and he was more of an expert in the Law that Paul). Even the Sanhedrin let Peter and John off with a beating. What made Stephen more dangerous than Peter? Paul, being a Jew and knowing the Law inside and out, and he practiced that Law like any other good Jewish man would. In Acts 6 false testimonies were brought on Stephen about speaking against the Law. Although it says they were false witnesses, I’m sure Stephen was speaking against the Law in some capacity. This in itself would be enough to enrage a group of people. I doubt Paul even saw what he was doing as wrong. In his mind, he was probably doing God a favor by getting rid of a “false teacher”. If Stephen preaching against the Law or temple wouldn’t be enough to stone him, then what he says in his speech certainly would. He calls them stiff-necked people, and goes on a rant and cuts them pretty deep. All of these things aside, It’s not very hard to imagine why these people would be upset. They have Jesus killed because of what he was teaching, and Stephen is telling them the same thing. If they killed Jesus because of it why not Stephen? There is some pretty deep discussion going here.I would like to draw attention to what Andrew said, “Paul, being a Jew and knowing the Law inside and out, and he practiced that Law like any other good Jewish man would.” Paul was a very smarty man when it came to the law. I can see how some would be enraged over Stephen speaking against the law in some sense. in Acts 6:12 we read ” So they stirred up the people and the elders and the teachers of the law. They seized Stephen and brought him before the Sanhedrin. Stephen was speaking on behalf of the good news about Jesus Christ and the people thought he was there only to abolish the law and make it look bad. Jesus was crucified by the Jews because he did not live up to their expectations and did not like what he was teaching and now they are doing the same thing with Stephen. The peak of the roman empire came around the mid 2nd century, so when Saul stood giving approval to Stephens stoning was when Rome was well on its way to the peak of its civilization. Saul being a devote Jew as well as a devote Roman I think gave him two reasons to want Stephen dead. Last section of Reading that we did we discussed about the reason that were brought up against Stephen and why he was stoned. It was that he spoke against the law of Moses (Acts 6:12-14). But I almost wonder if there was an underlying political reason that had to deal with Stephen. I also wonder the same thing about when Paul, formerly known as Saul, when he was persecuted in other territories that were under Roman control. In Pisidian Antioch was one of the Roman territories like we read about on page 87 of Polhill. When he tried to preach the gospel there to the Jews he was rejected, possibly because the same reason that Stephen was rejected. But because it was Roman occupied territory I wonder if they heard about Stephen and the possible thought that he was making an accusation against Rome, and decided to reject Paul for fear of their own lives? “as a devote Roman” – you are going to have to defend that statement. he was certainly a Roman citizen and did not advocate rebellion, but to be a “devoted” citizen, I would think that he would have had to commit to Roman gods / emperor worship at some level. I serious doubt any commitment to Rome led to the persecution of Christians – maybe it was fear of Roman reprisals if the messianic movement grew.